What is public history? I remember being asked this question on my first day in the “Intro to Public History” M.A. seminar at Carleton University. I knew why I wanted to study Public History (please give me a job in history? ), but I found myself struggling to define it on the spot. I quickly learned that public history is not just doing history for the public outside of academia, although this is part of what it is. 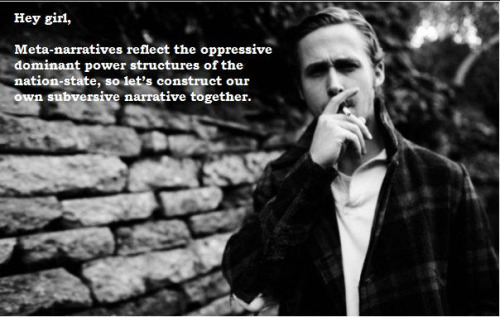 Source: Public History Ryan Gosling. Public history is about the ways in which history is created, contested, disseminated, and presented to us all. It’s a way of practicing history, but it’s also a field of study in itself. Public history forces us to think about notions of authority and power, identity, collective memory, audience(s), and narrative. Usually, public history is practiced in traditional sites like museums, archives, and memorials, but it can also be found in more subtle places in every day life; it’s the narrative in your grandmother’s carefully crafted photo album, the oral histories that we hear from elders, the nationalistic tone in a political ad, the historical video game we play, and the erasure and absence of histories in a quickly-gentrifying neighbourhood. At last month’s Active History Conference, I attended a panel on the Future of Public History programs in Canada. In this panel were representatives from Public History (PH) programs and employers from government institutions. It was interesting to have employers, students, and representatives from programs all in the same room. What emerged was an interesting discussion about what students are being taught, what employers want, and what employers think about PH programs and their graduates. Why do students need to specialize in public history? This post will explore this question and will discuss what history departments across Canada are up to, what employers want, and what public history programs offer. This might be helpful for undergraduate students thinking of specializing in public history, or for high school students who are thinking about post-secondary education in history. Employers and faculty stressed the importance of blending theory with practice. It wasn’t enough for students to understand the theories behind public history, but they had to have experience making, or creating history. Graduate students at Carleton and Western get to complete an internship during their studies. Program coordinators noted that these internships are an important part of the M.A. program, and that students need to have experience in a public history setting. A lot of undergraduate history programs offer courses that explore topics like memory, commemoration, and the history of museums. But at the end of the day, employers want students to have experience doing history outside of the classroom. Theorizing history can only take you so far. It’s great if students can grasp Pierre Nora’s theories on the lieu de mémoire, but it’s much more practical to get them involved in an actual archive or to have them collaborate on the creation of a memorial of some sort. Here, students can bridge theory and practice together and see how all that acquired knowledge can apply to the real world. Students have something to put on their resume showing employers that they have experience and can do the job. Employers commented that public history graduates have one skill that gives them an edge over traditional history graduates. Employers noticed that PH graduates are great at brevity. PH graduates are taught to convey complex historical events, narratives, or theories to a general audience in a few words. Employers don’t want to spend extra time training new hires to write for a non-academic audience. When you’re writing a plaque or a briefing note, there is no space or time to get into the historiography, or methodologies, and different interpretations of the issue at hand. There’s usually a limit on how much depth you can add to a particular topic. Unlike most history courses, you don’t have 15-25 pages to develop your ideas in a work setting. PH students are taught to distill historical knowledge into less words, and to cater the history “aka product” to specific audiences. Having an undergraduate course with an assignment component that develops these skills is great. Some examples include having students write a plaque summarizing a local history topic in 100 words or less, or writing a briefing note providing the historical context of a current issue. Another asset that employers actively seek out, and often find in PH graduates, is a diverse range of skills. Faculty from PH programs noted that they tried to offer this to their students through coursework. Some examples of valued skills include experience in digitization, archival processing, creating exhibits, GIS, working on/with databases, designing walking tours, creating historical performances, and writing museum content. In an ideal world, employers want an employee that can do it all, but this is not always possible. But the panel concurred that if students have the opportunity to acquire more skills through their programs, that they should take advantage of this. More skills means that they are more attractive hires. Undergraduate courses that give students the opportunity to hone these skills are on the right track. Short answer: yes. PH program representatives lamented the amount of time and money that went into finding and securing internships, but agreed that they were ultimately worth it for the students. Internships are worth if for the universities and the programs too. Building long-term relationships with outside partners, such as local archives, museums, and government departments proved invaluable. Sometimes these relationships turned into permanent internship spots every year and saved program coordinators some time and money. Through internships, students are able to build relationships with employers, grow their professional networks, and secure jobs prior to graduation. I conducted some online research to explore how public history is being offered in history departments across Canada. There are currently two (English) graduate programs in public history and three undergraduate programs. Both Western University and Carleton University offer students an M.A. in Public History and Concordia, Waterloo, and Bishop’s offer undergrad students the option to specialize in Public History. There are graduate programs that give students the option to specialize in a public history field, like archival sciences or oral history. I discovered that a little over half of the undergraduate programs offered students at least one course in public history and this is great news. A small number undergrad and graduate programs take things to the next level by offering their students practicum or internship opportunities, usually as an entire course. A little over half of departments had some form of practical experience incorporated into coursework, or in the form of an internship. As noted above, internships and practicums are very beneficial for students and universities. About half of the history programs are trying to incorporate practical experience throughout coursework, a trend that I didn’t observe ten years ago as an undergrad. Things have changed. Although, I’m wondering if departments need to rethink how they’re designing undergraduate history programs in general. For the most part, undergrad history programs teach students to be academic historians. On average, they offer one or two courses per year on a public history topic. Diversification of skills, and the blending of practice and theory is important for employers, and giving students the option to get hands-on learning in different settings, in several courses throughout their degree would help. Most students do not go on to graduate studies in history and need to find employment, typically they end up in journalism, heritage, museums, the civil service, publishing, education, and law. Students do leave history programs with valuable transferable skills. A History degree teaches students to synthesize knowledge, to assess and analyze differing opinions, to think critically and to have independent thought. It can help students become experts at noticing patterns and trends over time. History students are also taught to be effective communicators, writers, and researchers. But could their programs be doing more? Having programs focused more on teaching public history skills might be more attractive to undergrads. Based on this study, it looks over half of the history programs across Canada are trying to offer more public history related skills, which is promising. After all, programs should try to make their students more hireable, as well as solid historians. Today, if undergrad students want to further their education in public history, they have the option of applying to two great programs at Western or Carleton. For a summary of my research on history departments in Canada, click here. Kaleigh Bradley holds an M.A. in Public History from Carleton University and is an editor at ActiveHistory.ca. I looked at all of the public universities across Canada that offered either a three year B.A. in History, or a four year Honours B.A. in History. I looked at all of the undergraduate courses offered for 2015-16, or at least, what I was able to find online. If course listings from past years were available, I looked through those as well. I equally considered graduate programs in History and their course offerings. In order to qualify as a public history course, the course was either classified as “Intro to Public History” or it was a course that specialized in a public history topic, such as oral history, digital history, collective memory, archives, heritage, and museums. In weighing practical experience and internships, course syllabi had to be available online, or at least a detailed course description had to be available. In some cases, this wasn’t available so the lack of data for these entries doesn’t realistically reflect what that course might offer students in terms of practical experience. When looking for practical experience, I only read through public history courses. If there were other courses that had practical experience as part of the coursework, they do not appear in this chart. I define practical experience as hands-on experience where students are either engaging with the communities they are studying, or collaborating with organizations, communities, institutions and museums to create a historical product (examples included exhibit, processing archival material, designing a walking tour, creating websites or app, and collecting oral histories). I did not consider field trips as practical experience, given that they are usually a one-time excursion or visit off campus and don’t offer students tangible practical engagement in public history practices. If you feel as though I’ve missed something from your department, please leave a comment below and I will update the chart. Great stuff. As a convert to the wonders of co-operative education, this is yet another piece of supportive evidence. Just a gentle corrective to your spreadsheet: University of Waterloo has had an “applied history” degree-level specialization [https://ugradcalendar.uwaterloo.ca/page/ARTS-Specializations-in-History] (yeah, the title makes it hard to discover, eh?) and our undergrad program is increasingly being oriented around public history. We’ve offered ~ 4 courses a year in public history, and as of next year the major capstone project offered to students can take the form of a major research paper but also a public history project. Our students have had great public history projects: taking over the lobby of the library to showcase work (twice now), installing public art projects, and even presenting their work at the CHA (I think we had the only undergrads there in 2014). Note that this isn’t your fault that you missed this – we call it something other than public, and university websites aren’t the easiest things to navigate. Thanks for pointing that out Ian! You’re right, I didn’t see that on the department website. That’s great that Waterloo offers the applied history specialization. I remember Waterloo used to have a public history program too. I updated the chart to reflect these options. Thanks David. I’ll add this to the chart.